If you caught our face to face announcement back in October, you know how excited we are to welcome the band back into our FAT family. With the band celebrating their 25th anniversary in 2016, and us celebrating our 25th anniversary in 2015, it seems like a perfect fit. After all, we’ve clearly shown we know how to throw a 25th anniversary party, so why should our talents go to waste just because the year is ending? 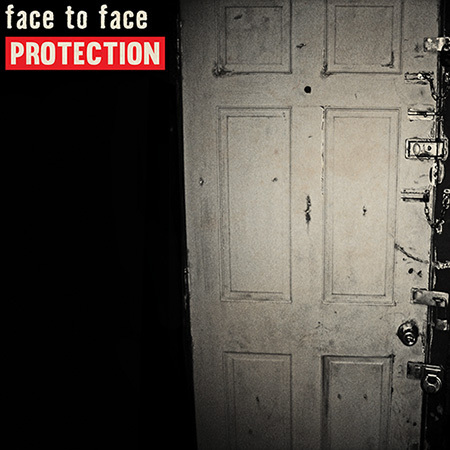 With that in mind, we are thrilled to announce that on March 4th, 2016, we will be releasing Protection, the first face to face album on FAT in over 20 years! Produced by Bill Stevenson and Jason Livermore at The Blasting Room, Protection marks the first time in nearly two decades that the band has employed an outside producer. This record is an intense and powerful 11-song endeavor that borrows from the melody and angst of the band’s early days. With that trust in place, face to face was able to spend less time in the control room and more time focusing on their performances, and on the songs themselves. The result is an instant classic from first listen! If you are itching to hear a brand new song, be sure to check back in January, because that’s when this party starts!